If you run a company in the information technology or communications fields, you know how competitive the market can be for new business. In the Information Age, every enterprise needs to be connected. And, they need a reliable company to service them. But, how can you make your communication services stand out from your competitors? The most affordable way to do so is putting your trucks to work for you with fleet vehicle wraps for South Jersey. Do you own a contracting business? If you’re not big on websites and social media, there is a very effective branding and marketing tool you should consider adding to your advertising budget—work van wraps! 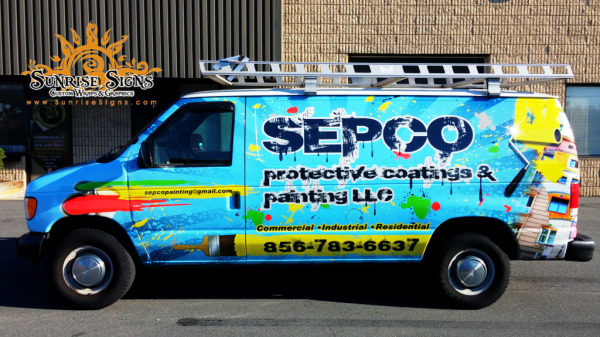 Sepco Protective Coatings & Painting, LLC came to Sunrise Signs with three Ford E250 vans pumped about fleet wraps and how easily they could spread the word about their business.